One of the recent issues of urban/suburban gardening is the declining population of pollinators such as birds, bees and other insects. While we spray pesticides to get rid of insects we consider pests, we also do damage to the beneficial populations. Keeping bees in the garden is extremely beneficial. 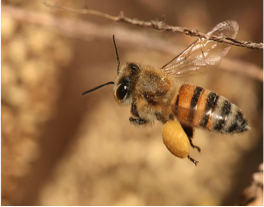 Bees pollinate our flowers, our trees, our fruit and our vegetable gardens. Without these buzzing pollinators, squash flowers wilt without producing zucchini, apple trees may produce buds, but won’t bear fruit, and the berries just stay bushes. Although the European honeybee is one of the best-known pollinators, they sting, and quite frankly, not everyone likes bees. I certainly don’t. I can appreciate the benefits I derive from them, but I don’t like the prospect of being stung. I am embarrassed to admit that I have been known to swat at bees as they dive at me, while simultaneously squealing and ultimately running jerkily away to another part of my yard. So, if you are like me, and consider the prospect of attracting more bees into the garden to buzz around you, as, well . . . icky, then consider the Mason Bee as a alternative to the honey bee. 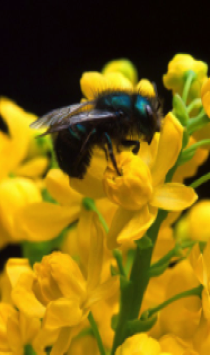 Native Mason Bees pollinated the fruits and flowers of our continent before the import of European Honeybees. Many people have seen Mason Bees, without realizing their significance: small, black insects feeding on flowering shrubs. You may see a Mason Bee and mistake it for a large, black fly. These stingless bees can help pollinate your plants, something needed more and more as European Honeybee populations decline. The pros of Mason Bees: (1) they’re entirely non-aggressive; (2) they will not attack, singly or en-masse; (3) you won’t know they’re around unless you stand and watch a nesting block; (1) they’re easy to keep in your yard from year to year; (4) they’re much more efficient pollinators than the honey bee; and they propagate in the smallest of back yards. There are a few very easy things to do to attract the Mason Bees. First, start by planting bee-attracting plants. Next, be sure your yard or garden is pesticide-free. Pesticides and Bees are incompatible. 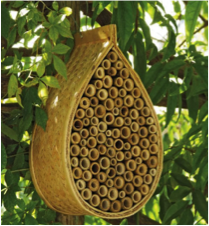 Finally, you can hang bee blocks in your yard to create a nesting habitat. That’s a real pretty mason bee nest. You can also make your own…see Dave’s Bees. That’s what I did last year. Another thing about Mason bees is that they will out pollinate a honeybee 10 to 1. In the books I’ve read it’s like 200 Mason bees will out pollinate 2000 honeybees. Around here their season is late March to early June, so it pays to have honeybees too for the later season too (like blackberries etc.). I know the thought of getting stung will scare people a little, but I’ve never been stung except for messing with their hives and I don’t do much of that. They are very tolerant when I’m taking photos of them as close as an inch away.